The Cleveland Browns have landed superstar wide receiver Odell Beckham Jr in a bumper trade with the New York Giants. The two teams made the move official at the start of the new league year on Wednesday. As a deal was previously agreed to swap Giants defensive end Olivier Vernon for Giants lineman Kevin Zeitler, the two deals were announced together, with Cleveland sending the Giants a first-round pick in the 2019 draft (No 17 overall), a 2019 third-round pick (No 95), safety Jabrill Peppers and Zeitler for Beckham Jr and Vernon. The Browns will be giving young quarterback Baker Mayfield, 23, one of the best wide receivers in the NFL as his newest target, potentially turning a barren franchise into a Super Bowl contender. Beckham, 26, finished with 77 catches for 1,052 yards and six touchdowns in 2018, the first of a five-year, £72m contract he signed last offseason. 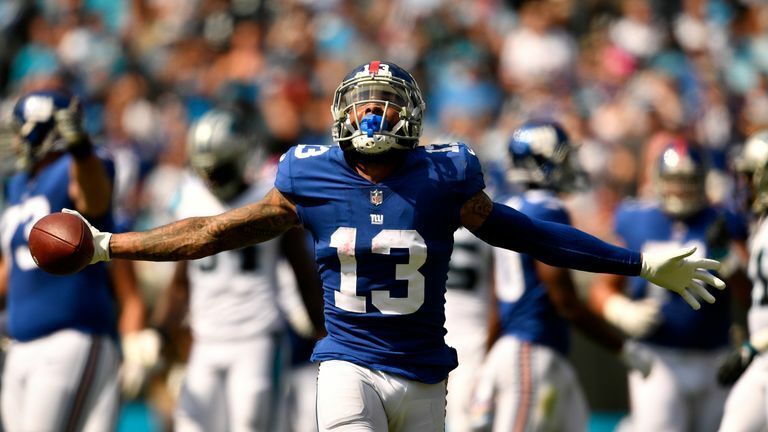 But there had still been months of speculation about his future, and Giants general manager Dave Gettleman said as recently as March's NFL combine the Giants would not be trading their star wideout. 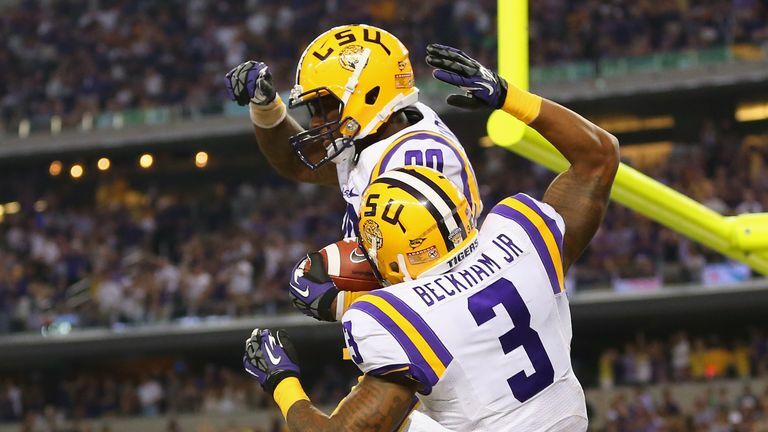 The deal reunites Beckham with former LSU team-mate and fellow wide receiver Jarvis Landry and gives Mayfield a potent 1-2 punch at receiver, to go along with a now-loaded backfield with Nick Chubb, Kareem Hunt and Duke Johnson. Browns general manager John Dorsey told the team website: "It's a reflection of the direction the organisation is headed. "My hat's off to a lot of people in this organisation because we spent countless hours, weeks - I mean, we can go all the way back to December when we began the planning phases of these types of acquisitions. "[Beckham] is probably if not the one, one or two best receivers in the National Football League. Pro Football Talk host Mike Florio talks to former NFL quarterback Chris Simms about Odell Beckham Jr's shock trade to Cleveland Browns. Although Beckham was reportedly unhappy to hear he was moving away from New York, he joins a Cleveland team on the up. He said: "I'm extremely excited about the opportunity to be part of this organisation and the direction they are headed. "I've already witnessed the energy fans bring in that city having been to some playoff games at The Q. Browns fans deserve a winning football team. This is a fresh start for me and it's going to be great to join Baker (Mayfield) and Jarvis (Landry) on this team. "The Browns are an organisation that is moving forward and it's exciting to be a part of something special that is in the process of being built. "We have a lot of work ahead of us but I really feel like it's time for the Browns to come together, start winning a lot of games and I'm grateful to be a part of that going forward." The Beckham trade transforms both the Browns and the Giants. The Browns infamously went 0-16 in 2017, winning only one game in two seasons, but recovered to 7-8-1 last year with a handful of talented rookies and are now a force in the AFC North, and the whole league. GM John Dorsey has overseen the turnaround. The Giants, meanwhile, went 5-11 in 2018 and have stripped down to spare parts on defence, while also sticking with veteran quarterback Eli Manning, who has just lost his main target.